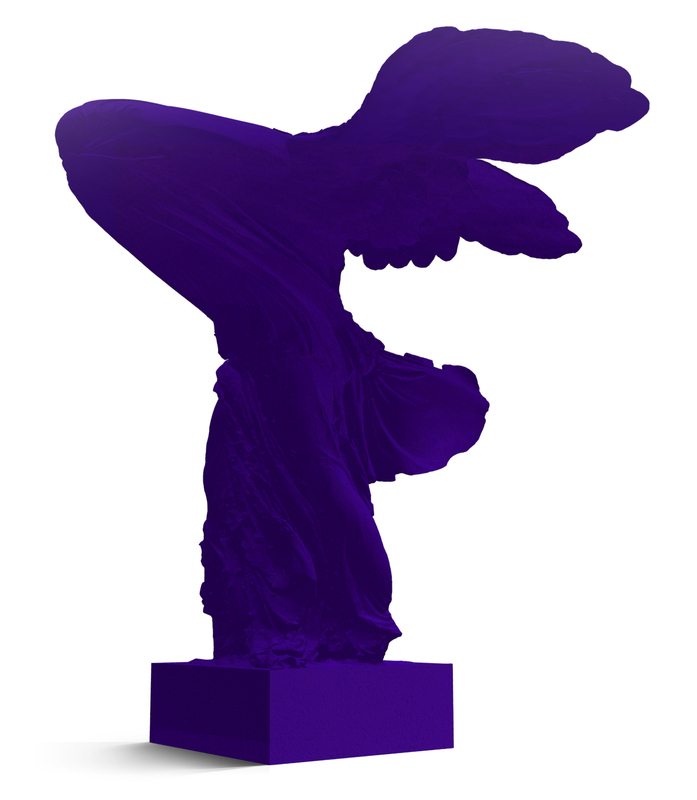 “The winged victory of Samothrace”, also called “the Nike of Samothrace”, is a marble Hellenistic sculpture of Nike (the Greek goddess of victory) that was created circa the 2nd century BC (circa 220-185 BC) to celebrate a naval victory. 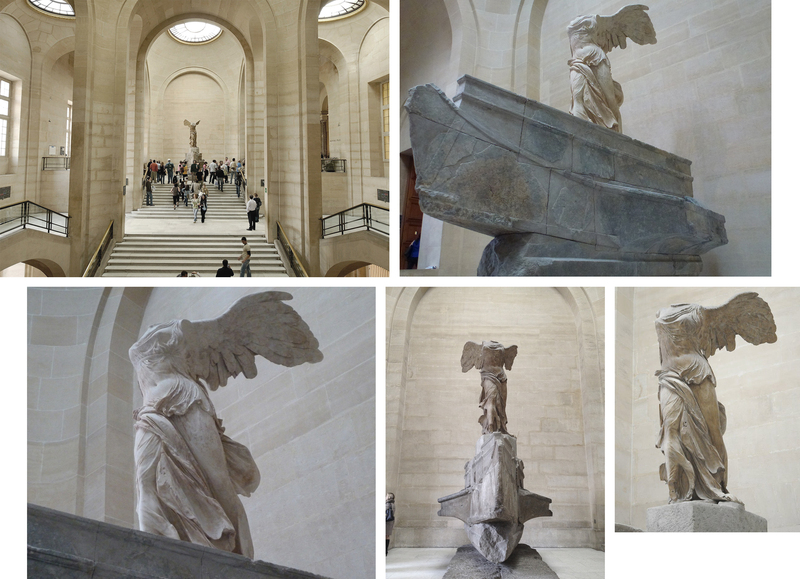 Today exhibited at the Louvre museum, it was discovered in 1863 by a French diplomat, Charles Champoiseau, on the Greek island of Samothrace in the northwest Aegean Sea. 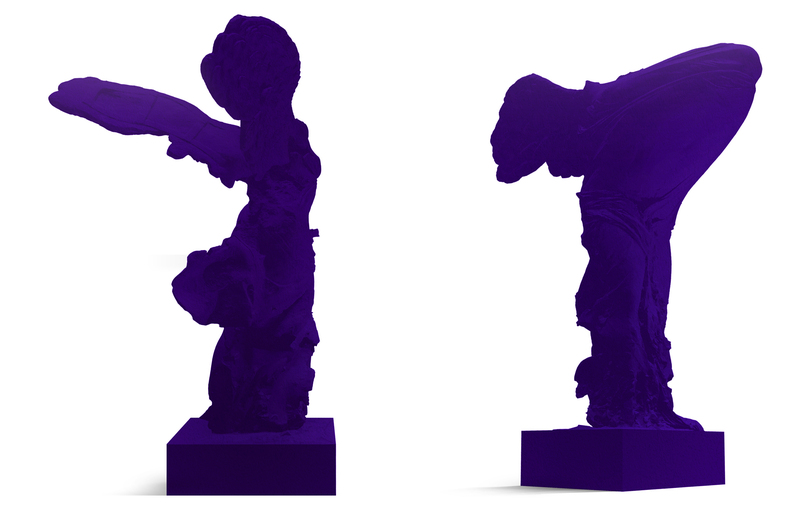 The present data sculpture project entitled “Nike 001d” consists in reshaping/remodeling/deforming the masterpiece in the ancient world on the basis of data of the present World gathered from the UN Refugee Agency—UNCHR (Operational Data Portal) concerning the migrants sea arrivals in Greece (surrounding the Greek islands) from January 2014 to January 2019. The purpose of that data-driven re-creation is to achieve a kind of historical “telescoping”, spliting (or time dilation) effect that reflects (and also symbolizes) the course of human history in its astounding repetitions, analogies and recurrences as well as its deep dissimilarities, differences. “The Winged Victory of Samothrace” is one of the great surviving masterpieces of sculpture from the Hellenistic period, despite the fact that the figure is significantly damaged, missing its head and outstretched arms. By an unknown artist, presumably from Rhodes, the sculpture is thought to date from the period 220 to 190 BC. The statue stands on a pedestal of gray marble representing the prow of a ship, and shows the goddess as she descended from the skies to the triumphant fleet. Rendered in white Parian marble, the figure originally formed part of the Sanctuary of the Great Gods. Before losing her arms, Nike’s right arm was raised, either to bring a trumpet to her lips as she is depicted on coins or to crown the naval victor. The prow is made of gray marble from Lartos. The statue has been reassembled in stages since its original discovery in 1863. The prow was reconstructed from marble debris at the site by Champoiseau in 1879 and assembled in situ before being shipped to Paris. The discovery in 1948 of the hand raised in salute, which matched a fragment in Vienna, established the modern reconstruction. The right wing is a symmetric plaster version of the original left one. Various other fragments have since been found: in 1950 one of the statue’s hands was found on Samothrace and is now in a glass case in the Louvre next to the podium on which the statue stands. Neither the arms nor the head have been found. The art historian H.W. Janson has pointed out that unlike earlier Greek or Near Eastern sculptures, Nike creates a deliberate relationship to the imaginary space around the goddess. The wind that has carried her and which she is fighting off, straining to keep steady, is the invisible complement of the figure and the viewer is made to imagine it. At the same time, this expanded space heightens the symbolic force of the work; the wind and the sea are suggested as metaphors of struggle, destiny and divine help or grace. 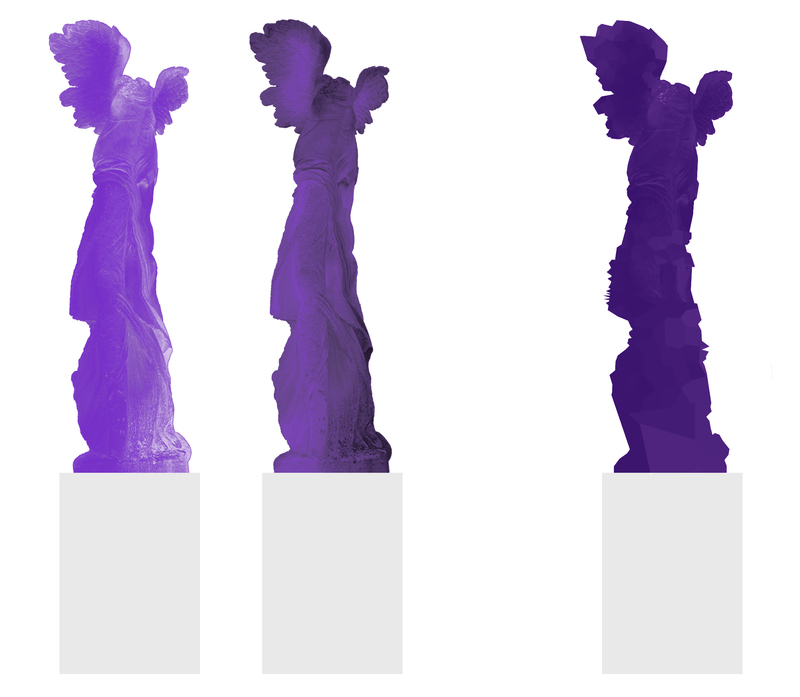 Through this data art project entitled “Nike 001d” (in reference to a preliminary occurence of an experimental data-driven shape deformation/distorsion process), I firstly aimed to create a sort of “chimera”, a truly strange and intriguing data-based artwork which reaches to illustrate two cultural-social-political realities from very different eras — two strongly separate times that share, however,the same unity of (geographic) space: the Greek islands (including, of course, the island of Samothrace). In choosing the Nike of Samothrace as a data-driven remodeling “starting point”, I wished to maintain a key relationship to the Aegean, also to the issue of “sinking”, and to clearly mark a symbolic reference to the perils of wars as well as to the epics of the survival of the human being. To do so, I have looked quite naturally to collect data about the Refugee and Migration Crisis in the Aegean I — it should be noted that today a number number of migrants arrived in Greece are still forced to remain on Aegean islands. I found almost instantaneously the dataset I was seeking on the UNHCR Refugees Operational Data Portal that provides refugee situations over 69 countries — the office of the United Nations High Commissioner for Refugees (UNHCR) is the UN Refugee Agency. UNHCR work to ensure that everybody has the right to seek asylum and find safe refuge, having fled violence, persecution, war or disaster at home. 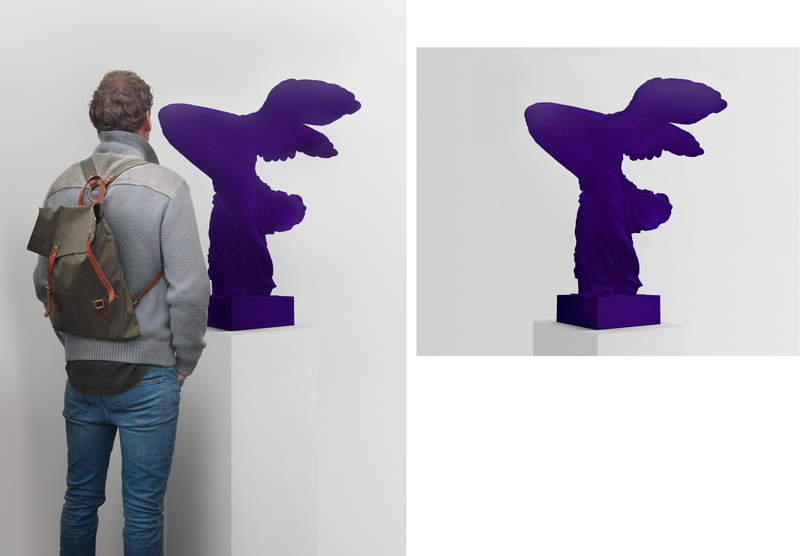 Thinking at all times to the “Samothrace Victory” (painted in IKB ultramarine blue) created in 1962 by Yves Klein, I have quickly made the decision to compose a monochrome data sculpture (in order precisely to pay homage to this brilliant French artist). Therefore, I pursued to draw sketches, drafts and to realise graphical mockups to find the good artistic direction. * My colleagues Samuel Bianchini and Raphaëlle Kerbrat from “The École nationale supérieure des Arts Décoratifs” (EnsAD) — EnsADLab (Art and Design Research Laboratory of “The École nationale supérieure des Arts Décoratifs”) for their continued cooperation and unwavering support. David Bihanic, “Nike 001d”, April 2019.